Jeff Thomson's sculptures are predominantly made of corrugated iron – a cheap, tough and pliant building material strongly associated with the New Zealand way of life. In Thomson's words: 'it's so immediate, easy to join, to add to, it's versatile – can be curved, stacked, layered, cut into strips and woven. It needn't stay indoors.' 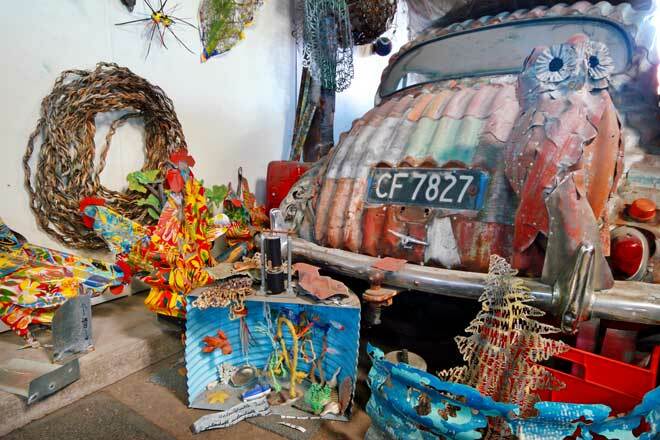 Some of the works shown above, in his studio in Helensville, are braided corrugated iron rope, screenprinted chickens, a Morris 1000 car and a morepork.